Micromeritics ASAP 2420 Accelerated Surface Area and Porosimetry System uses the gas sorption technique to generate high-quality data for applications that require high performance/high sample throughput. Standard features include six independently operated analysis ports and a programmable and fully automated sample preparation module with twelve independently operated ports. With six independently operated analysis ports, a new analysis can begin as soon as another is finished. This provides an important advantage over many multiport instruments that require all samples to be prepared or analyzed at the same time. Extended analyses can be performed without refilling the Dewar. This allows unattended analysis of high resolution adsorption/desorption isotherms. BET surface area analyses utilizing six parallel runs can be achieved in as little as 30 minutes. 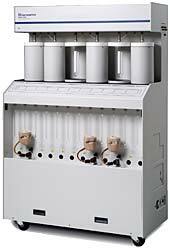 The system allows dosing options of maximum volume increment or dosing over specified pressure ranges. The analysis temperature can be entered, calculated, or measured. Long-duration Dewars and patented Isothermal Jackets assure a constant thermal profile along the length of both the sample and saturation pressure (P0) tubes during the analyses. The P0 value may be entered, or measured either continuously or at selected intervals. The equilibration interval is user specified and enhanced to allow the user to define equilibration intervals for different parts of the isotherm. A low surface area option that uses krypton as an adsorptive to measure total surface areas of 5 m2 or less is available. This option features a turbomolecular drag pump, which provides the high vacuum required for krypton analyses, and a 10-mmHg pressure transducer, which allows accurate, repeatable pressure resolution. This option utilizes five of the six available sample ports. In addition to controlling the instrument’s operation, powerful Windows® software also reduces the raw data collected during the analysis. The reduced data can be reviewed or printed in a variety of easy-to-interpret tabular and graphical reports. The ASAP 2420 system includes twelve automatically controlled sample preparation ports that operate independently. Samples may be added or removed from degas ports without disturbing the treatment of other samples undergoing preparation or analysis. The sample preparation system is fully automated with controlled heating time profiles. The temperature and ramp rate can be set and monitored individually and controlled from a few degrees above ambient to 450oC. The temperature hold period may extend past the point when evacuation is completed. A programmable pressure threshold can suspend the temperature ramp if the outgassing pressure exceeds the limit specified, preventing destructive steaming or other undesired reactions with residual gases and vapors.